The Samurai Tarot is presented as the journey of the "inner Samurai" through the tests of life. The path is defined by an elaborate moral and behavioral code termed Bushido. The basic philosophy of Bushido is complete freedom from fear, including the fear of death. The goal of the original spirit of Bushido focuses more on the "inner enemy" than on external ones. In this manner, the legacy of the Samurai keeps alive the path toward moral progress and the forming of a mature personality - the process of "individuation" that is the Tarot. King of Pentacles: The monk Kukai. Queen of Pentacles: Daruma. Knight of Pentacles: Minamoto Yorisomo (the first shogun). Knave of Pentacles: Kabuki Ichikawa Danjuro(actor). 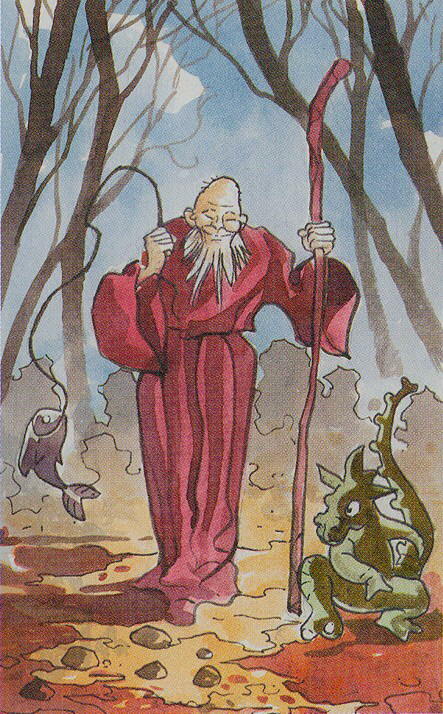 King of Wands: Shidoken (monk). Queen of Wands: Murasaki Shikibu (author). Knight of Wands: Shoki (hunter of demons). Knave of Wands: The Soga Brothers. King of Chalices: Nichiren (monk). Queen of Chalices: Ono no Komachi (poetess). Knight of Chalices: Minamoto no Taretomo (archer). Knave of Chalices: Tenjin (patron of caligraphy). King of Swords: Takuan (monk). Queen of Swords: The Heron Maiden. Knight of Swords: Miyamoto Musashi. Knave of Swords: Oboshi Yuranosake (head of 47 ronins).